Suitable for Gas, open fire and oven. Enamel paella pans are made of steel. They are coated with a black and white speckled enamel, so rusting will not be an issue. It is easy to clean and store and it won't need oiling after use. It has a slightly convex base that allows the oil to collect in the centre to assist in the first stages of preparing and cooking the dish. 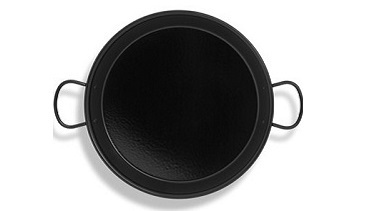 Enamelled steel paella pan There are 24 products.